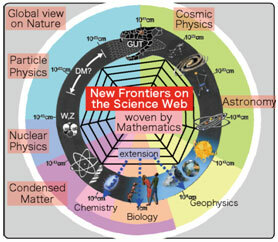 Natural science has developed mainly with researches on the phenomena within each “Particle-Matter Hierarchy” formed along the universe creation and evolution, such as elementary particle physics, nuclear physics, condensed matter physics, astronomy and cosmic physics. Needless to say about the importance of the deeper research within the hierarchy, exploration of inter-hierarchical research frontier yet overlooked even by advanced intelligent majorities is indispensable for further development of physical science. Young scientists carrying such development have to lead a research in an international environment and have to possess wide view over natural science and science ethics for practical applications. On the other hand, separation between basic science and social interest under people’s unfamiliarity to science and deterioration of mathematical skill is argued in Japan. Thus, important things are research development concerning social relation and the nurturing of young talent who will continue the research development and will act as an opinion leader to bring up importance and outcomes of science researches to public. Based on the experiences of propelling international cutting-edge researches in wide range of hierarchies under the previous COE program “exploring new science by bridging particle-matter hierarchy,” this program attaches great importance to international collaboration and challenging new fields. International research collaborations and foreign institutes with an agreement on cooperative education program are synchronously organized as a Global Education Hub. We strongly promote characteristic studies in every hierarchy and also explore new science frontiers through extensive increase of interconnections among hierarchies just like weaving a web. This Science Web provides an environment to pursue deep studies and to explore new science frontiers and thus new challenging fields. And, it is full of zeal in making the best use of the given environment for nurturing students. In addition, it cooperates with the philosophy course and it challenges a new activity that removes the fence between Science and Liberal arts, too. It is convinced that a lot of unexplored science frontiers can be developed by promoting the cooperation among diverse fields, and many appear one after another top-class personnel having rich internationalism and a broad outlook. Thus, students grown with the education will create a new academic culture and contribute to a social innovation. The research and educational environment achieved by weaving science web and by establishing global education hub will continue after this program as a world premier science research/education center. This program will widely distribute cutting-edge researches and will provide many young talents with science literacy and adaptability to the society. These young talents will connect basic science and social interest, and will contribute to raise the intellectual level of humankind. At the same time, talents experienced international cooperation in this global education hub will take active part in various countries and will become foundations of cordial relations to those countries.